John Burke buys, sells, trades and appraises diverse numismatic (collectible) and bullion (precious metal) coins and collectibles. He is a member of the American Numismatic Association (ANA). 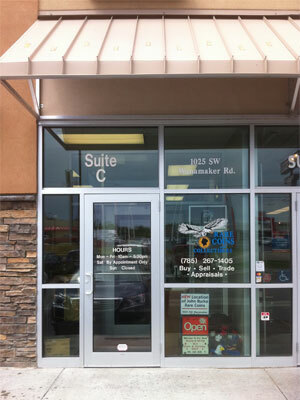 Visit the shop on SW Wanamaker between Jimmy John’s Gourmet Sandwiches and Qdoba, and diagonally across (to the NW) from Freddy’s Frozen Custard and Steakburgers at 1025 SW Wanamaker Road (Suite C), Topeka, Kansas 66604. The store is open on Monday through Friday from 10 a.m. to 5:30 p.m. You can visit on Saturday by appointment. It’s closed on Sunday. Gold and silver are great investments, and bullion coins are an excellent way to add precious metals to your portfolio. They tend not to follow normal market forces, even running counter to it at times, and add stability to a group of investments. 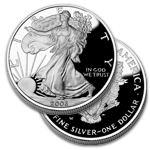 American Silver, Gold and Platinum Eagles are guaranteed by the U.S. Government to be official investment grade bullion. American Platinum Eagles are made of .9995 fine platinum. The platinums are available in 1-, 1/2-, 1/4- and 1/10-oz. coins. 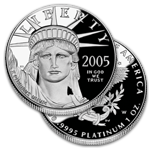 You can learn more about their specifications in the brochure on the U.S. Mint’s Platinum Eagle information page. American Gold Eagles are made of 22-karat gold. They are available in 1-, 1/2-, 1/4- and 1/10-oz. 22-karat coins. 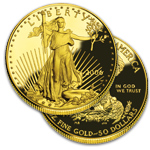 You can learn more about their specifications in the brochure on the U.S. Mint’s Gold Eagle information page. American Silver Eagles are made of one ounce of .999 fine silver. They weigh 1.000 troy ounces (31.103 grams), containing 31.072 grams of silver. (The balance of the coin is copper.) You can learn more about them in the brochure on the U.S. Mint’s Silver Eagle information page. 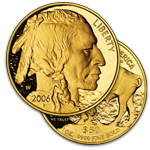 The new American Buffalo gold bullion coins are also a great option with one ounce of .9999 fine gold. You can learn more about them on the U.S. Mint’s Gold Buffalo information page.